Playing the new demo for Mario Tennis Aces last night was the most fun I’ve had with Mario Sports in a long time. And while playing, I realized that I was using tricks from my real life tennis experience to best other players. 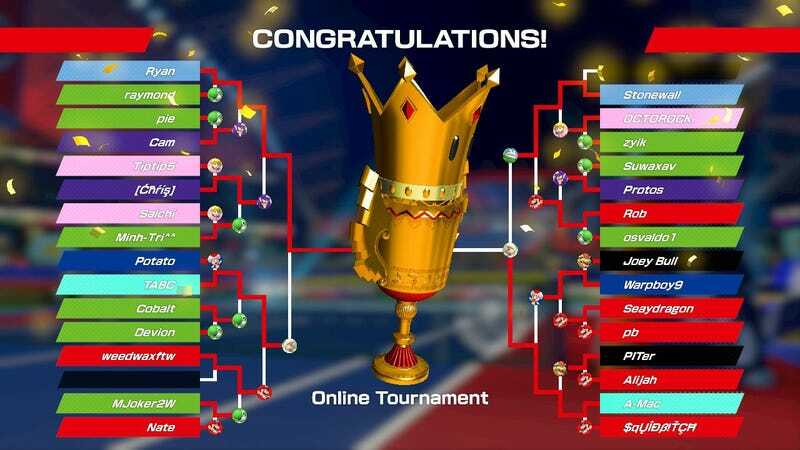 I’ll leave it up to you to decide if that’s good or bad, but here are a few examples of how “real” tennis can help you win Mario Tennis Aces: Online Tournament Demo’s titular tournament. Before we dive in, I want to note that I am far from an expert tennis player. I played for one year in high school, and was varsity by technicality (all seniors are varsity). Grand Slam tournaments are the only things that get me watching. This is all pretty basic stuff. What was interesting, to me, was how these virtual strategies mirrored my real tennis experience. So, without further ado, let’s talk tennis. Move to the net until your opponent proves they can lob over you. This is something I struggled with tremendously in my tennis heyday. How do you cope with a player who moves to the front court (near the net) away from the baseline (where you serve)? Occupying the front court as Yoshi. Ignore Toad, he doesn’t know what he’s talking about! Going to the front is a good strategy because there are only two ways out for your opponent. One is to hit a blistering shot down the side of the court, fast enough so that you cannot reach it. Their other option is to use a lob, a slow, high-arcing shot that sends the ball over your head and into the back court. Mario Tennis features characters with nigh-impossible reflex speed, so you’ll be hard-pressed to sneak a shot down the side. Fortunately, using the lob in Mario Tennis is easier than using it on a real court. Here’s a video where my opponent successfully lobs it over me, forcing me into the back court. He’s playing Bowser, a powerful, slow character, so he’s at an advantage if we’re both near the baseline. There, Bowser can take more time to charge his shots and get to the ball. A lob is more difficult to do than any other “standard” shot in Mario Tennis, meaning many opponents - especially people new to the demo - won’t be able to figure the input out. Moving to the front court means you can smack the ball side to side without worrying about moving too far to get any shots. Until your opponent figures out how to lob the ball over your head, they’re in tough shape. Where you should be hitting it brings us to our next strategy. Hit it where they ain’t, then hit it where they are. Human beings love patterns. We recognize them and follow them. That’s why the most devious finishing move in this game is to break your patterns. Once you’ve moved yourself to the front court, you’ll be able to scatter the ball side-to-side with impunity. If you just hit it to the left and right in sequence, however, your opponent will be able to catch up to it (in Mario Tennis especially). The trick is to establish the left-right-left-right pattern and then break it at different points. The video below shows how you can establish the left-right pattern early, giving you room to break with it later. Once you’ve established the pattern, any break messes with your opponent. Hitting it right twice will make them unsure where the ball is going next. From there, you can make any number of variations, until you’ve got a cozy loft set up in your opponent’s psyche. Here’s a play where I hit left-left, barely miss getting the point, and then get it going right-right. See how badly the opposing player wants to the ball to be hit away from Mario? The winning shot is hit directly where he was standing just an instant before. Written out, I suppose this sounds quite obvious. If you think so, I would encourage you to try your hand at the game. It can be surprisingly difficult to break out of that left-right-left-right monotony. It’s most likely because we want to hit it where our opponents aren’t, but they expect that, too. Hit it right at them and they’ll seem as if they’re running away. A good server in Mario Tennis (or real tennis) can make it extremely difficult to get strong returns and win points. That’s why winning a game in which you’re the returner is highly valuable (especially in men’s tennis, where volleys are shorter). The server decides where on the court you’re going to run to, and if they’re smart, they’ll have a plan for your return prepared before you even hit it. That’s why, instead of backing off to make sure you return their serve, it’s good to occasionally run towards it. Roger Federer, arguably the greatest men’s tennis player of all time, has popularized this aggressive return. It’s even got a cute nickname - SABR (or Sneak Attack By Roger). Fortunately, you don’t need to be the GOAT to pull this off in Mario Tennis. Sneak attacking a serve allows you to get to the net immediately and either contend with the server at the net or pressure them into lobbing the ball over you. This puts you in an advantageous position off the return, which is extremely valuable. In this video, the aggressive return immediately puts Mario on the defensive, leading to a quick and easy point. This technique is definitely harder than returning serve regularly, so it’s best used sparingly. When you pull it off, however, it’s another thing your opponent has to think about every time they serve. If they worry about you sneak attacking and play more conservatively, it gives you an advantage even if you’re not going for the throat. I hope these tips were helpful and interesting, even if you’ve never played a day of tennis in your life. Mario Tennis Aces: Online Tournament Demo is well worth checking out if you like online multiplayer or Mario Sports. It even lets you unlock characters as you win more matches. The one thing I found disappointing was a lack of local multiplayer. I suppose I was spoiled by ARMS’s Global Testpunch. This game wasn’t even on my radar before I played the demo, but I’m going to have to think about it pretty hard when the full title releases. The demo runs until 3 AM this Monday (Eastern Time). Check it out.